This month I would like to share with you an online hunt I did. It is a sustainable-plastic-building-blocks-hunt! As you might imagine, with children growing up, our house is gettingcovered in plastic more and more. Some people might call it toys. Now I knew that with kids comes stuff. For most of the clothes the kids need I have many choices. There are some really cool brands that take care just about everything that you want to think about when buying clothes, organic, sustainable, people-friendly or even recyclable. The toy branch seems to be running behind a bit. Can you spot the Banbao blocks? Apart from the visible toys, I sometimes imagine the pile of packaging plastics that accompanied these toys when they came into our possession. That pile would be approximately the same size, is my guess. Even more so if you take into account the plastics that are used during the shipping process. I worked in a repackaging factory for a short time, and as you can imagine they do not spare plastics when trying to protect items during transportation. As we were starting off to buy Lego, instead of Duplo, I decided to ask Lego when we could expect some bricks that were made out of natural recources. Or recycled ones. Or biodegradeble ones. Or whatever-they-think-of-that-shows-some-inventiveness. Apart from that I was a bit dissatisfied with the themes they have. When you go to a Lego store the main point of sales seem to be characters. Kids are immersed in characters on clothing, toys, etc. What 3 year old has seen Star Wars, and knows what a storm trooper is by the film? Yet they own a tee with them on it. For me as a kid, Lego felt like a league on its one. Surely they can come up with something that doesn’t rely on the gained popularity of a movie or show? On their website I can see much more different themes there, compared to how the store is filled up. But the character based themes are still a major, if not the biggest, part of their collection. Even bigger if you count all the shooting and good versus evil themes. Anyhow, while I was corresponding with Lego (read here: Correspondence Lego) I got information about how Lego is “aiming to use responsible resources by 2030.” It is a bit vague what they mean, but it seems they want to go completely biodegradable in one go, rather than bits at a time. I can see why that approach might be beneficial. 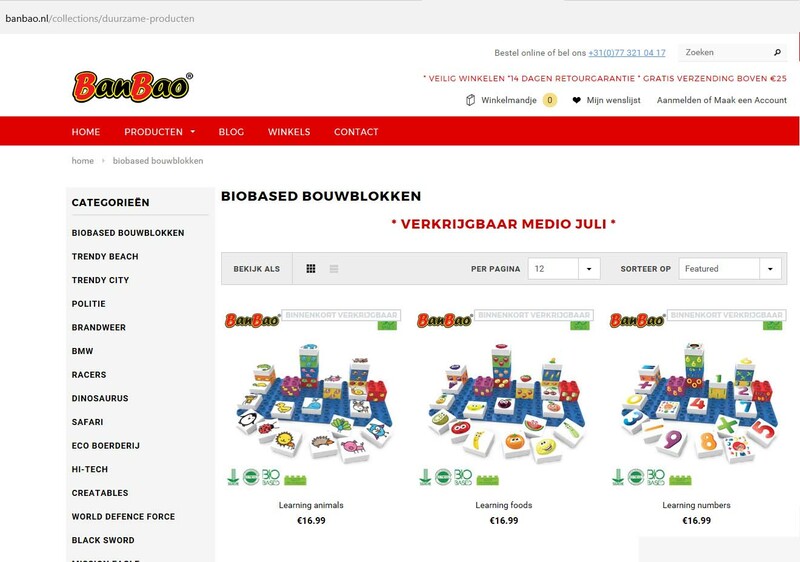 At the same time I ran into an article about a Chinese Lego-clone: Banbao , so sorry it’s in Dutch, that are starting their first line of biobased blocks. Just a few blocks for the smallest kids. Just a small grab from the products available soon These product seem to be only available in the Netherlands. It seems they only sell, as well as produce, them in the Netherlands, as I cannot find them on the Banbao websites from different countries. In the article about the bio-blocks from Banbao it says that they have an advantage, as they are a smaller company and therefore are better at “working towards a certain goal”. It seems to say the same thing as in my correspondence with Lego when the Lego corresponded Yvonne quotes “it takes a bit of time and care especially on an international scale”. With that last email from Yvonne I cannot help to think that as I am sure they do an effort, they could have started this effort ages ago. The first external communication from Lego about wanting to change was in 2012. That for me is at least 10 years to late to be seen as a leader. It is rather following they do. Consumers as well as governments asking to lower their footprint, if you like. For all my other product I have a lot of substitutes or choices. Not for my blocks. My enthusiasm leans on my memory of Lego, and how inventive we used to be with it. Not how novel and impressive it is now. Who knows my kids might prove me wrong when they are a bit more in the targeted age of Lego. They might find it very inventive. If not, 2030 will mostly be too late for me to love the new bio-blocks from lego. That makes me think, maybe I will have something to do after the kids move out of the house after all! Posted on March 30, 2017 by Marjolein. 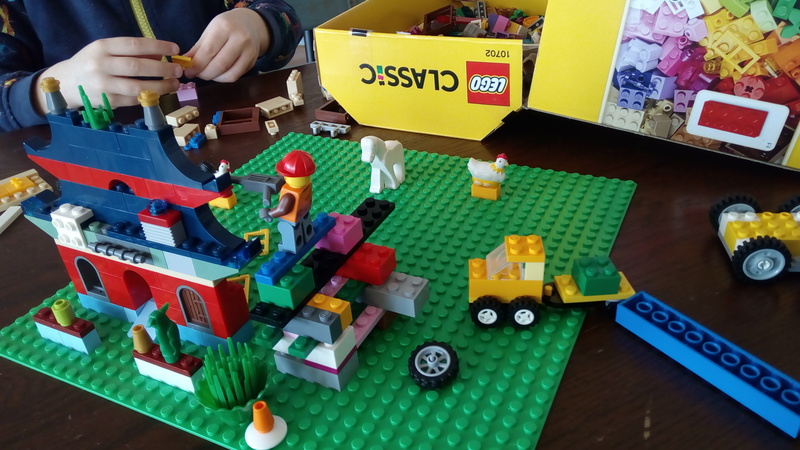 This entry was posted in Rethink and tagged Banbao, Lego. Bookmark the permalink.